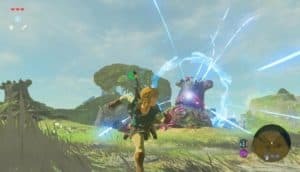 New Zelda Game In Development | Nerd Much? The next Zelda likely won't be delayed nearly as often as Breath of the Wild was. Now that the art book for Breath of the Wild has been released, we have learned that Nintendo is in fact working on the next Zelda title. The book, titled The Legend of Zelda: Breath of the Wild Master Works, shows us a few early concept pieces, mostly relating to the Breath of the Wild, and stated that the new Zelda title was coming in a note from Eiji Aonuma. There were no other details, which is unsurprising. Development for Breath of the Wild began almost immediately after Skyward Sword launched, and here we are. The next Zelda game could come out five or two years from now, there’s really no telling. After Breath of the Wild was delayed for long, Zelda fans should not be surprised to wait a while for the next title. That said, Nintendo won’t be dealing with the death of the company’s president, nor the introduction of a brand new console this time around. As such, the next Zelda likely won’t be delayed nearly as often as Breath of the Wild was. Though most fans are glad that Breath of the Wild took the time it did to make sure it came out as the great game that it is. Other previous information on the new title includes a few off-hand statement from Aonuma. The open world of Breath of the Wild is intended to stick around and the Zelda handheld team is going to stay separate from the larger Zelda team, even for Nintendo Switch titles, not just 2DS or 3DS titles. Well, I would say bets are on for what art style they’ll choose next. Will they get darker like Twilight Princess (like that first trailer we saw years ago that was supposed to be for Breath of the Wild) or even brighter and more detailed? My vote is for a darker looking game, but my bet is on a brighter game. As much as Majora’s Mask and Twilight Princess have always been my favorite Zelda titles, I realize that Nintendo exploring such dark themes is extremely unlikely.